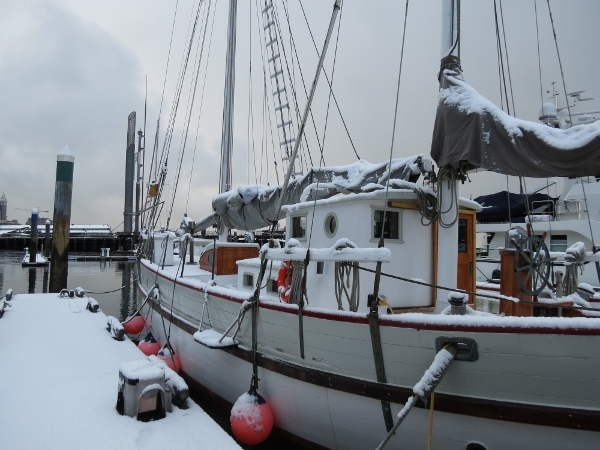 Snow is fairly rare in the Puget Sound, so a layer of the white stuff always is a treat. 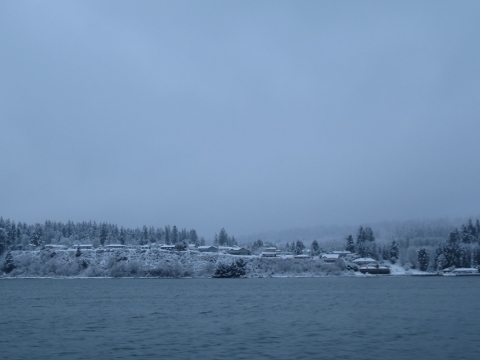 We’d spent the weekend in LaConner, where 2-3 inches of snow had fallen overnight, and left around 7 this morning for the run back to Seattle. 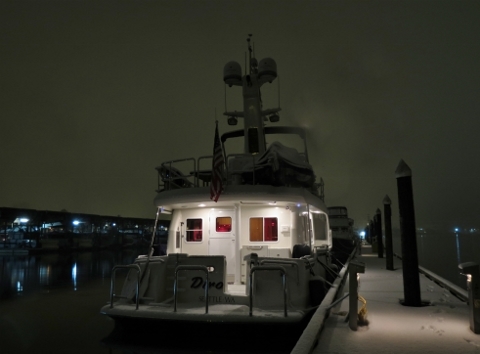 The trip through Swinomish Channel was magical in the dark. 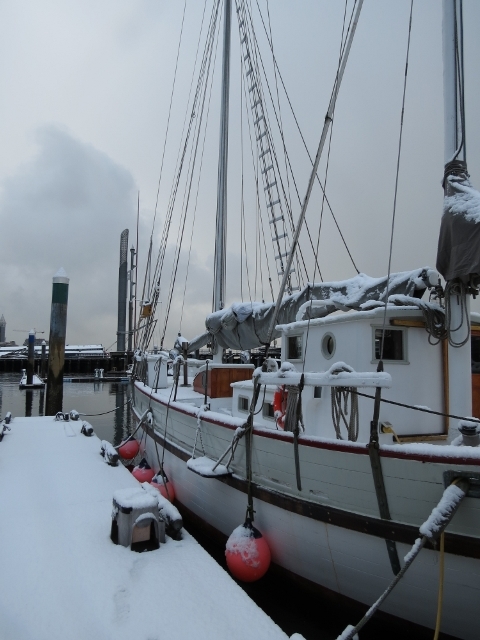 With few people about that early, the snow was mostly undistrubed and lay thickly on the rails and every flat surface of the many boats tied off on either side of the waterway. 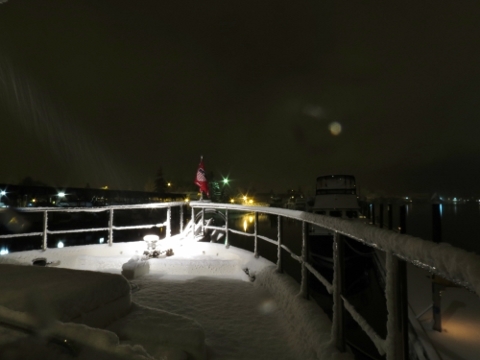 The white blanket softened all the hard edges and reflected the faintest light. Even the most tired-looking vessel we passed looked shiny and new. In the shoreside houses beyond town, a few early risers were reading the morning paper with a fire burning in their hearths. Their house lights cast a welcoming, golden glow onto the white landscape. At the steep cliffs near the turn west, snow clung to the rocky walls and filled the trees. Some of the communites farther south had snow, but there wasn’t much along the south end of Whidbey Island, so we weren’t expecting any snow in Seattle. 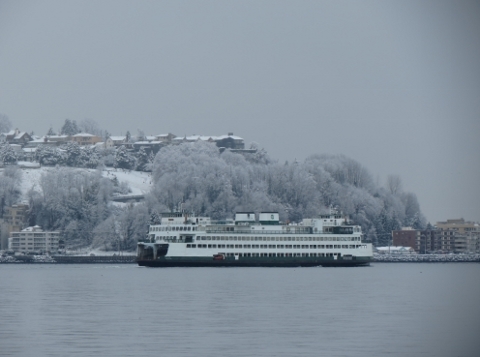 On VHF, we could hear Vessel Traffic talking about restricted visibility in Elliott Bay. 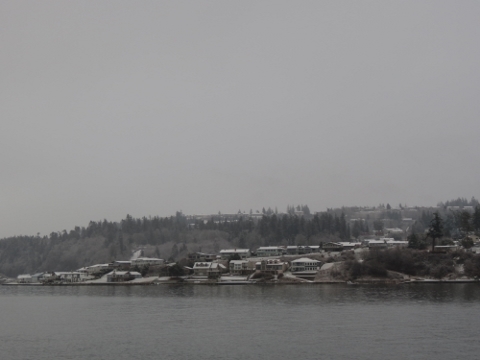 It was snowing fairly hard as we approached, we couldn’t see the other side of the bay. 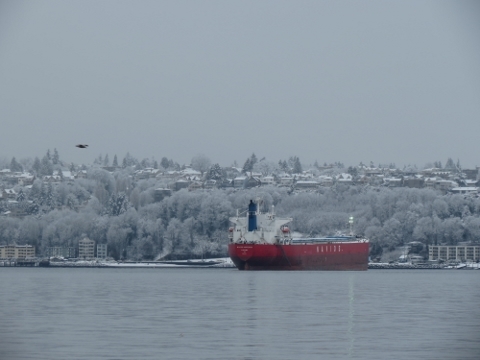 The storm lifted as we neared downtown, and West Seattle appeared, presumably with a fresh coating of snow. 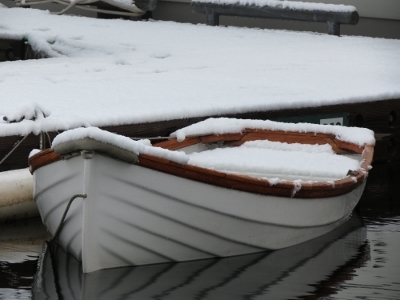 And an inch or two had fallen at Bell Harbor. 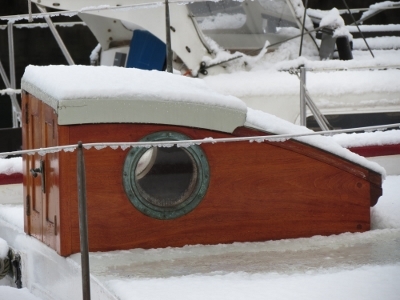 The classic wooden sailboat Skol looked wonderful with a layer of white. – I LOVE snow! :) These are amanizg! I love the angles and perspective, and she’s so pretty! :) Happy New Year!